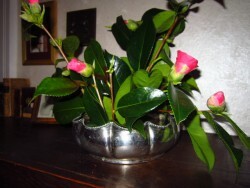 Both Nyel and I remember when my mother arrived at our house on the bay clutching a bouquet of camellias just beyond bud stage – small bright blossoms full of the pink promise of spring. It was February 28th, probably in 1993 or 1994. My dad had died a year or two before and, though mom was in her eighties and ‘a bit forgetful,’ she was still driving, at least on the Peninsula. I remember being so touched at her thoughtfulness and, at the same time, rather surprised that she even took notice of anything in the garden. That had always been my dad’s bailiwick. 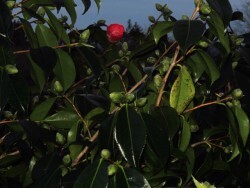 So, with that memory still firmly in place, it came as a great surprise to me the other day to notice that the old camellia bush by our east porch is beginning to bloom! By my count, that is almost three months early! Granted, I’ve been noticing for several years that the blossoms are now coming out before my natal day, but usually it’s a matter of days or weeks early, not months! I expect that people will tell me that we’ve had a mild fall or that the frost came earlier than usual. Maybe they will talk about a warm weather cycle or climate change or some other complex scientific phenomena. And no doubt they will be right. Bottom line: in this instance I really don’t care about the ‘why’ of it. I am simply delighted that there is color in the garden right outside my window and that this lovely memory of my mother hasn’t waited until my birthday to resurface. Thanks, Mother Nature, whatever your reason! I know how you feel. My rosemary by the barn is blooming and it makes me smile when I go to do laundry. Our garden in the Bay Area of California seems to have created its own schedule. Rosemary blooms throughout the year as does the thyme. Bulbs are a’poppin’ now…green shoots but not blossoms, yet. Still time to plant more bulbs which are chillin’ in the garage. Loved the memories of Sydney’s mother. Yes, my hellebores are early but I’m not complaining. And I noticed that the ceanothus along Howerton in Ilwaco was trying to bloom again last Saturday, although last weekend’s lows may have changed its mind! As long as it doesn’t harm the plant, I’m thrilled.